Nestled in Comarca of Garrotxa, in the province of Girona in Spain is a small town of about 2,361 people that have become synonymous with the tourism circuit of North Eastern Spain. It forms part of the intricate Judeo Network that boasts high value Jewish heritage monuments and artifacts all over Europe. The town was designated as a Historic National Property in 1996. It features several high value destinations as espoused below. This is a Benedictine monastery that was founded in 977 by Count- Bishop Miró and consecrated in 1003. If you have never seen ancient grandiosity, then you will see one at the monastery. One of the most distinct features of the monastery is the two lions on its large window to signify the power and the glory of the church. The lions also signify the strength of the church against paganism. 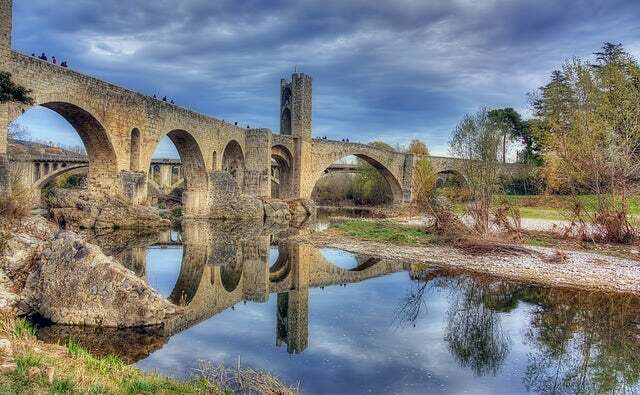 This is a bridge built using the ancient Romanesque architectural design. It is the most prominent feature of the town and overpasses the Fluvia River. It is the most suitable entry point to the old town. Make sure you carry your camera. The bridge offers beautiful sights of the town. The bridge is 150 meters long and is made more beautiful by the angular pillars that are placed on top of the river stones. This is Europe's best maintained Romanesque architecture building. It was built in the 12th century and has changed ownership among 3 families over the years. It was initially owned by Cornella Family but was later sold to Llaudes family. Today, it is owned by Solà-Morales family. If you want to see furniture by master carpenters of the past, then Casa Cornella is the place to be. This is the third largest underground Jewish Romanesque building in Europe. Also called Miqvah, the building has a religious purification pool with no inlets and outlets hence the reason why it is located a few meters in the ground to avoid evaporation. It was mostly used by Jewish women for purification after menstruation, childbirth, and before marriage. Religious men also immersed themselves every Friday evening before sunset in order to usher in the Sabbath as purified men. Other important things to see in the city of Besalu include; Church of St Vicenc', collegiate Church of Santa Maria, and many more. If you want to travel back in time, then this Spanish town is as good a place as any.